Science Fiction? Science Fact? You decide. Six light years from Earth, in the galaxy Croakatoria, exists a planet called AMPHIBIA. Some years ago, engineers in a small recording studio in Oklahoma started receiving signals from this small, distant planet. Not just ordinary radio signals, but messages about the happenings of civilized life forms existing on Amphibia. If your imagination will allow you to believe that life exists elsewhere, you can now listen and learn about the strange and exciting life on Amphibia. 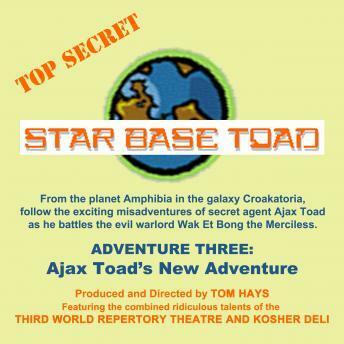 Follow the exciting misadventures of secret agent Ajax Toad as he battles the evil warlord Wak Et Bong the Merciless. Aventure 3 contains episodes 21-30.